Susan Miller, astrology master of the universe, has strongly advised that I (well, not just me but Pisces worldwide) wrap up holiday shopping by December 9. That's just two days! Given that Halloween seems like it was just last week, and that Thanksgiving came in a rush of gravy, I've really gotta get on the stick. In my consumer panic, I've gone keyboard crazy. In the last few days I've discovered some great treasures, and strangely they each have a writer/artist theme, making them great gifts to give — and keep! 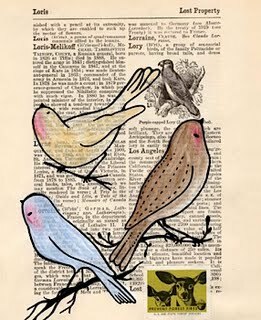 Portland, Oregon artist Trish Grantham paints directly on the pages of old books (a page from a 1935 Webster's Dictionary, for example, pictured here), to create layered pieces rich with history, texture and playfulness. Using acrylic and watercolor paint, Grantham creates a cast of doe-eyed, anime-like people, animals and anthropomorphized objects (like a charming slice of bread). Grantham's works are wonderfully original and affordable (paintings from $42; cards at $1.20) See her paintings here, and notecards here.